If you were kid growing up in the late Seventies, you were probably all about Stars Wars, but if you were carrying a lunch box to school before 1976, there is a good chance Evel Knievel was on it. Subsequent decades were hard on the self-styled daredevil, but fans like skateboarding champion Tony Hawk and Jackass’s Johnny Knoxville still remembered the tarnished icon. 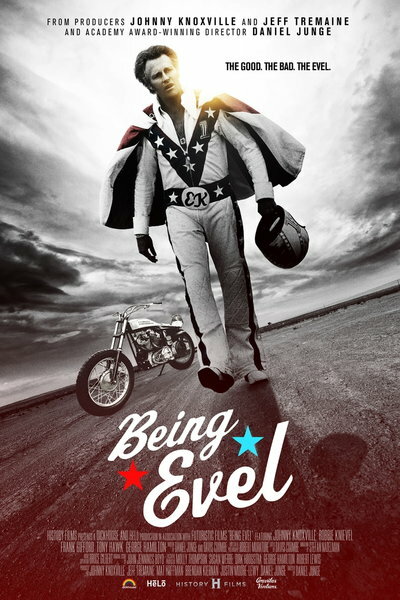 Daniel Junge revisits the highs and lows of Knievel’s story in the Knoxville-produced Being Evel (trailer here), which opens this Friday in select theaters. Butte, Montana was still a bit of a rugged frontier town when young Knievel grew up there, but their cops were pretty funny. According to legend, Knievel once spent a night in the holding cell with a fellow troublemaking named Knoffle, prompting a deputy to dub them “Evil Knievel and Awful Knoffle.” That worked for Knievel, after softening the “Evil” with a second e.
One can find barnstorming precedents for Knievel’s death-defying stunts, but Knievel came up at the perfect time to most fully exploit the media. There were only three real networks in the 1970s, so just about every sports fan watched the buffet-style coverage of ABC’s Wide World of Sports on Sunday mornings. Somehow Knievel talked his way on as the opener for a dirt track race and quickly became a media phenomenon. Seeing docs like Being Evel reminds us just how much the media landscape has changed within our lifetimes. It also explains the influence Knievel had on the culture, inspiring the extreme sports movement of the 1990s and perfecting an unparalleled personal merchandising machine. You will not see a lot of documentaries co-produced by Knoxville and George Hamilton (who played Knievel in the John Milius-scripted 1971 film), but here it is. 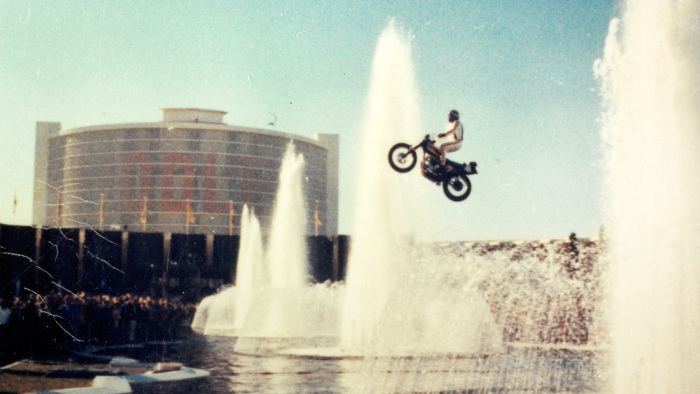 While carefully tracking Knievel’s cultural significance, Junge never loses sight of the outrageousness of his stunts. Frankly, he crashed out more often than his fans probably remember, which still makes voyeuristically compelling viewing. Junge talks to just about all of Knievel’s surviving family and associates, including his much neglected first wife and his former promoter, Shelly Saltman. Despite being on the business end of Knievel’s notorious baseball bat attack, the latter is remarkably gracious, all things considered. In many ways, Evel Knievel exemplified American self-invention. Being Evel clearly establishes his many flaws, but the risks he ran were still very real. Junge assembled some spectacularly dramatic and telling footage that evokes an era that is no so long ago, but feels so very far away. Briskly paced and stylishly constructed, it is one of the more watchable documentaries of the year. Recommended beyond the Knievel-extreme sports fanbase, Being Evel opens this Friday (8/21) in select theaters, including the Roxie in San Francisco, and also releases on iTunes.